St Paul's Churchyard was the next stop after Paternoster Square on my snow covered walk to work back in February. As promised Wren's Temple Bar is visible as well as the statue of Queen Victoria in front of St Paul's Cathedral. The statue of Queen Victoria is to the far left of the photo, with the unrecognisable bricks St Paul's Cathedral being at both ends of the photo. The next photo day will feature a more recognisable view of the Cathedral. The next stop on snow day was Paternoster Square. 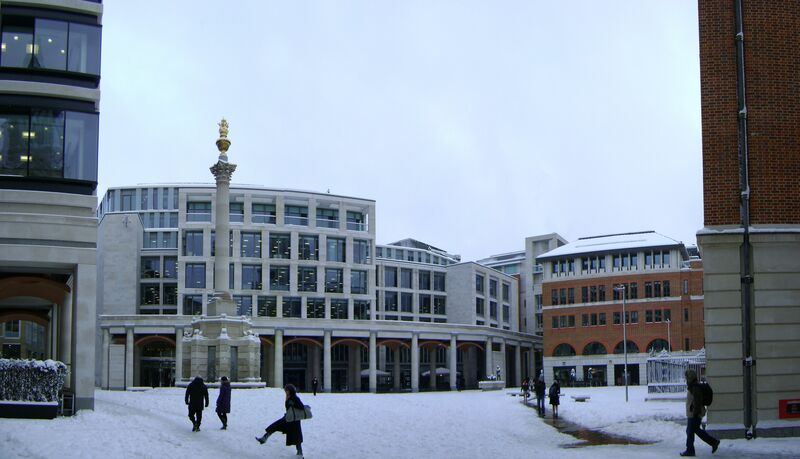 The Paternoster Square Column is near the centre of the photo with the London Stock Exchange behind it; Shepherd and Sheep if off to the right next to the Starbucks. Temple Bar is to my back and will appear in next weeks photo. Katie Price and Peter André won the EuroMillions and celebrated in Jordan with Rihanna and the cast of the new Star Trek movie. BBC Radio 1 has reported that Katie and Peter plan to purchase the entire F1 franchise and convert it into a reality show which will be broadcast on youtube with dvd sales available on ebay. The couple's Facebook site has been flooded with words of support from their fans, but an equal number of complaints demanding that they stop playing games. Yahoo news and Google news are already featuring the Daily Telegraph reports that Katie and Peter will not be getting a divorce and that they are quite content now they have all the money they think they deserve. If you came to this page hoping to get real information about Katie and Peter then I'm sorry to say you have come to the wrong place. The above text is an experiment in search engine ranking. Google have made available an iGoogle gadget that lets you see what people are searching for. The above text incorporates all of the search terms in the 'Top Searches' and 'Rising Searches' for the UK. This blog gets page 1 results for some search terms, so I wanted to see if I could achieve it with fictional information about real subjects. Still continuing with the snow theme, this weeks photo is of Holborn Viaduct. The Holborn Viaduct bridge has various creatures that adorn it, four of which are visible in this photo. This photos shows a large winged lion, two small quasi-dragons, and the Fine Arts lady in the photo; and just out of frame is the centre of the bridge which has some proper dragons. I believe the chimney in the distance belongs to The Central Cold Storage building on Charterhouse Street. The green barriers in the foreground prevent car damage to the bridge when drivers follow dangerous driving directions.